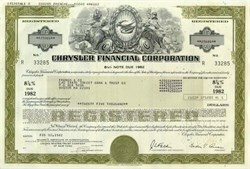 Beautifully engraved Stock Certificate from the Chrysler Financial Corporation issued between 1973 -1982. This certificate was issued just prior to the major financial crises the company experienced which led to U.S. Government bail out. This certificates was issued prior to the arrival of Lee Iaocca, whose leadership rescued the company from financial disaster. This certificate has a vignette of two nice looking allegorical woman surrounding the Chrysler Logo. The historic certificate is facsimile signed by the company's President, and Treasurer.